Dr. Dean Kereiakes from Christ Hospital, who operated on Cunningham, came on the air Friday to talk about his cardiovascular journey. 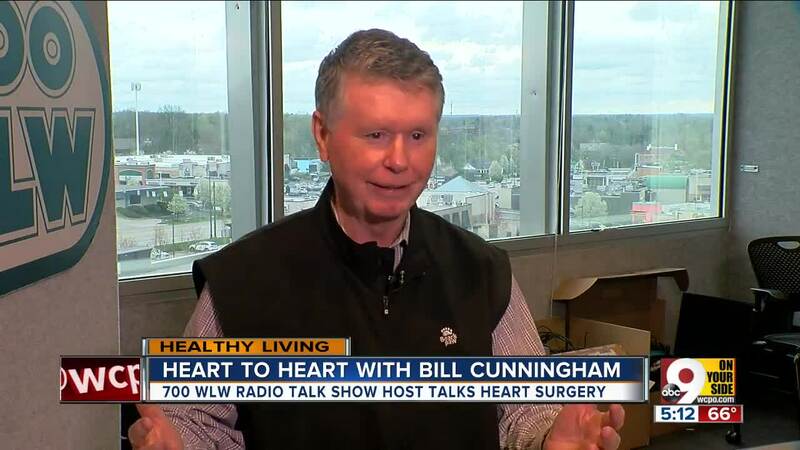 CINCINNATI — WLW radio talk show host Bill Cunningham almost didn't listen to his body. His wife, Penny, was the one who homed in on symptoms he has having: shortness of breath, lightheadedness and chest pain. When Cunningham took her advice and went to the doctor, he learned he needed a valve replacement, or he'd die. Cunningham had surgery on April 4 and returned to work Friday. He had Dr. Dean Kereiakes from Christ Hospital, who operated on him, on the air to talk about his cardiovascular journey. The radio host even talked about how reluctant he was to tell his wife about his symptoms. "If I told her going up and down stairs causes shortness of breath, it's going to worry here," he said. "And I didn't want to tell her." But Cunningham said he felt good Friday before he returned to his show, "like James Brown." "Dean Kereiakes told me I'd have twice the energy," he said. "I'm happy. I'm joyous. And the reason is, I feel like I've been saved." Cunningham's health was in danger. He'd been monitoring his heart for a specific condition: aortic stenosis, which involves a lack of movement of the aortic valve. "Once symptoms occur, average survival is one to two years," Kereiakes said. "So it's dire." Cunningham opted for trans catheter aortic valve replacement instead of more invasive traditional surgery. The result was great. "You saved my life," Cunningham texted the doctor. Kereiakes said he's done about 900 of the procedures. Both men shared some advice: take charge of your own health, and listen to your body.